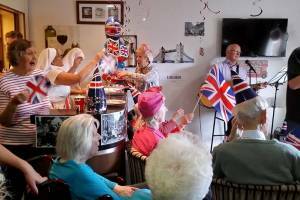 The 70th anniversary of the end of the Second World War in Europe was marked across all Carebase care homes on 8th May. Each home organised a variety of activities on VE Day to commemorate the date in 1945 when the German forces formally and unconditionally surrendered. Many of the homes welcomed visitors from local primary schools to listen to residents share their memories and experiences of their time during the war. Homes also invited family and friends from the community to join in their war-time themed parties, with live entertainment and refreshments.